SDN has a stand at this Wednesday’s See Hear Exhibition. You can see the details here: In the meantime here is the latest news update from Pauline Rose. The latest on the See & Hear Event Programme for Wednesday 14th May 2014 10am to 4pm at Shrewsbury Sports Village. I am extremely grateful for the support of Shropshire and Telford CCG Commissioners whose attendance at the event will enable us to have the RNIB Eye Pod. The RNIB Eye Pod sight loss simulator is coming to See and Hear Shropshire 2014, urging councillors, residents and public health professionals to make eye health a priority in their decision making. 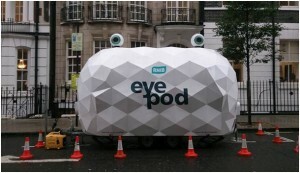 The futuristic pod has giant eyes connected to viewers that participants look through to experience conditions such as glaucoma and cataracts. We are working with local councils and clinical commissioning groups to improve access to treatments and raise awareness of the causes of avoidable sight loss. Following on from last year’s theme we are promoting health and wellbeing, preventing avoidable sight loss. There will be some new ideas and thought provoking activities, which will hopefully create another wonderful opportunity for everyone to take part in and assimilate what the day has to offer. I am very excited at what should be an amazing Event; both in terms of the publicity that the Exhibition has generated this time but also by the full and exhaustive programme for the day. I am sure that you will already be aware the day is a great opportunity for peer support, networking, gaining knowledge and sharing information with others and is important to everyone; it highlights how Healthy Lifestyles can prevent avoidable Sight Loss. Recent studies show that smoking more than doubles the risk of developing Age-related macular degeneration. In light of this, it is vitally important to make people aware and encourage them to take advantage of the complimentary Eye Screening on offer by the Local Optical Committee. There will be Hearing screening by Audiology and carers’ assessments by People 2 People as well as other routine health checks and this time we have over 65 Exhibitors with stands. I would be pleased if you could encourage Social Workers and any of your contacts through the Care Services to attend as I am sure this would be hugely beneficial to both themselves and others who are taking part in the event. Sight and Sound Technology are offering workshops on the Respexi Home Tablet which is a new touchscreen tablet that provides a ‘window to the world’ by way of a simple interface for instant messaging, reminders, face-to-face video calls, photographs and radio. Helping to create a safer home-living environment, enabling people to stay living in their own homes for longer, Respexi offers peace-of-mind to family, friends and carers. There will be the Guide Dogs’ sensory tunnel and obstacle course to experience life without sight and how a guide dog might help people, again to remain as independent as possible. The Braille Forum will give an understanding in the use of portable braille devices, working with Android, Iphones and Ipads. Also there will be Seeing Skills sessions run by the Macular Society. We have full use of the Sports Village and there will also be Sports taster sessions, including the climbing wall and a fitness instructor will be available to talk to visitors, provide BMI results and fitness programmes. The Sports Village have also given us their assurance that the refreshments and facilities will be well organised and include a Hog Roast. Shropshire Public Health, include Shropshire Heart Age Testing and Healthy Shropshire will be including smoking cessation, physical activity, healthy eating, weight and alcohol management. I hope that you will be able to attend and enjoy the day as I am sure it will evoke a great atmosphere and be a very pleasurable and rewarding experience. This entry was posted in Blog, Uncategorized on May 12, 2014 by penval.